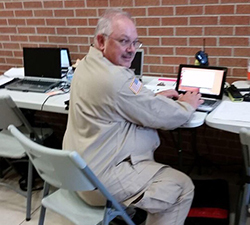 Soon after record-breaking Hurricanes Harvey and Irma hit, public administration faculty Robert Skertich, Ph.D., Roy Cox, Ed.D., and Daniel Fitzhenry, Esq., as well as alumna Kate Jones Lambert, deployed to various regions in the south. Skertich was sent to Key West, Fla., Cox and Lambert went to Dickinson, Texas, and Fitzhenry served in both Dallas, Texas, and Atlanta, Ga. Together, they and their team members treated thousands of individuals in need of medical care as well as distributed food and clothing to the hurricane victims. 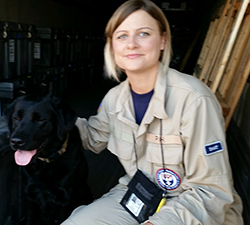 Skertich, Cox and Lambert are members of Pittsburgh's U.S. Department of Health & Human Services' Disaster Medical Assistance Team, otherwise known as DMAT PA-1, and Fitzhenry is a member of the National Disaster Medical System Incident Response Coordination Team. "I'm very thankful to have had the opportunity to be in Dickinson. That community will always hold a special place in my heart. I think about them every day and the long road ahead of them rebuilding their community. When we serve others we often find that it ends up changing our own hearts for the better, and the people of Dickinson have certainly changed mine," said Lambert, prehospital coordinator for Allegheny Health Network's West Penn Hospital and paramedic for West Deer EMS and Parkview Volunteer Fire Department and EMS. Fitzhenry, an attorney and counselor at law, said he deeply related to one of his team members when he said: "The waiting and the unknown of what we would do or where we would serve was a new type of stress that we never had experienced before." "It was an honor to go and help people in need, but it was difficult seeing people lose everything," explained Cox, district chief for the City of Pittsburgh Bureau of Emergency Medical Services. "The experience was also a reminder that we need to take nature seriously," Cox added. For Skertich, many would describe disaster relief to be part of his DNA. He has worked in it at the local, national and international levels since the 1980s. 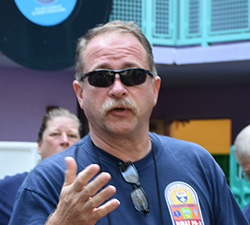 "My involvement with disaster relief grew out of my fire and EMS background and medical planning for airport and other community disasters," he said. Skertich added: "There was a lot of damage in the Keys. The infrastructure was significantly impacted, including the local hospital (Lower Keys Medical Center) so we were treating at least 60 patients a day."